After all,whats life,anyway?We are born ,we live a little while.yes, a few of us live a little while the rest merely survive. I am Dhivya Ravi, 24 yrs old here fundraising for my elder brother Dinesh Ravi. He was all full of life until that happened in his life. Good that he did not die and a curse that he is not living either. 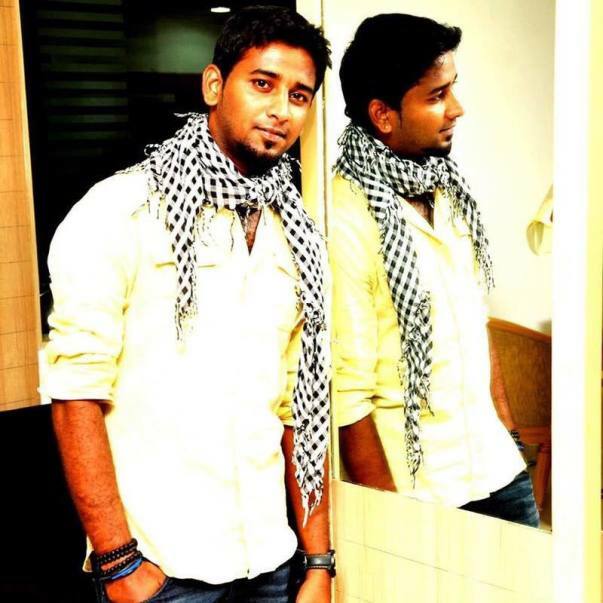 Dinesh met with a fatal accident on the month of December 2nd 2014. 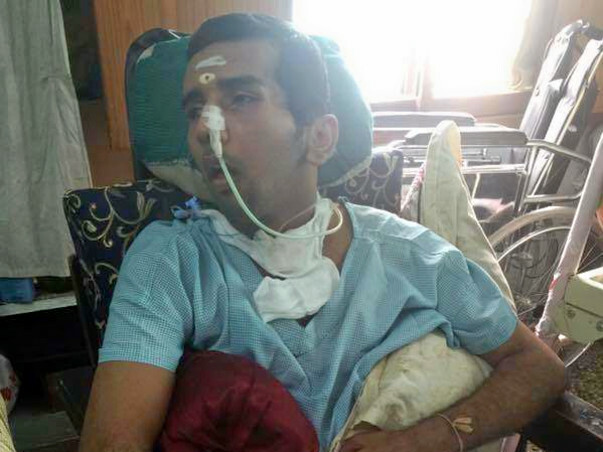 He was rushed to Apollo hospitals with no conscious and earbleed. 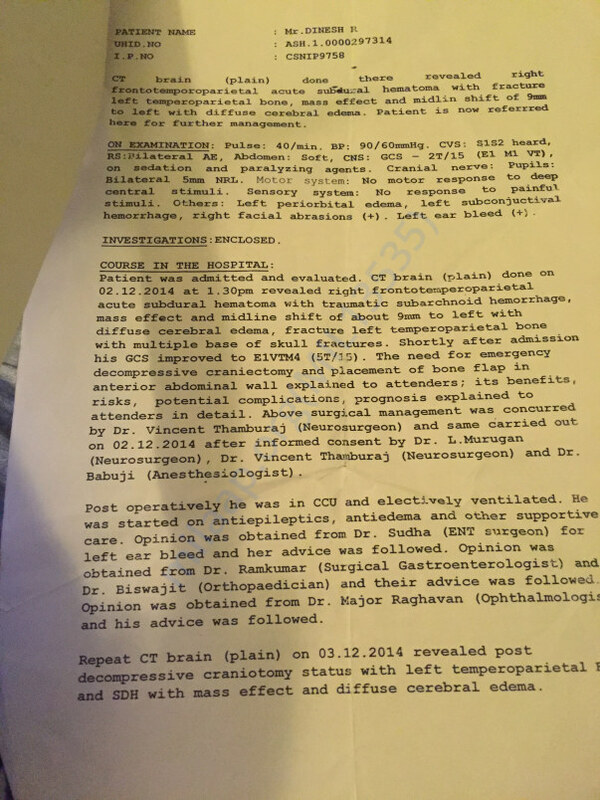 He was diagnosed to have RIGHT FRONTOTEMPOPARIETAL ACUTE SUBDURAL HEMATOMA WITH TRAUMATIC SUBARACHNOID HEMORRHAGE WITH MIDLINE SHIFT,MULTIPLE SKULL FRACTURES. We were counselled by team of surgeons regarding the need of emergency decompressive craniotomy and the procedure was done on the same day. 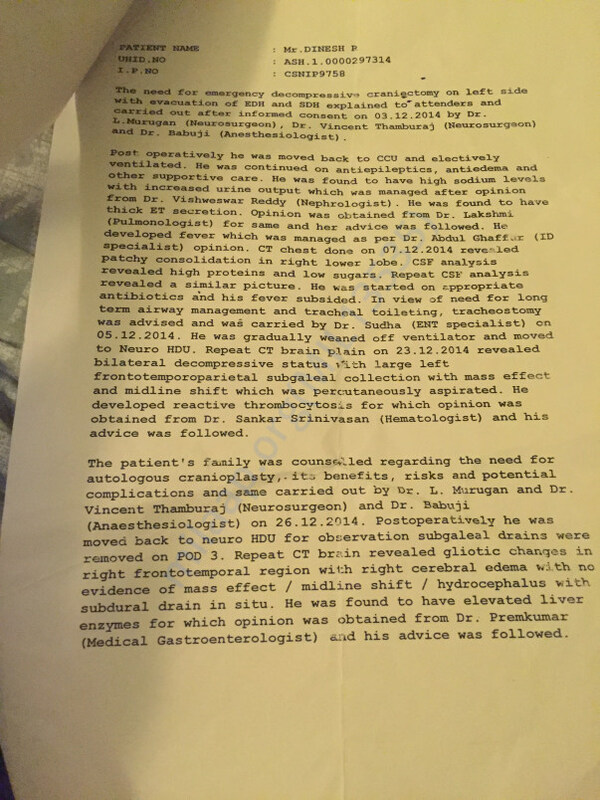 He is still in treatment from then, and is in coma with no motor or sensory stimuli. We had to do few more operations in 2015. However mercy seems void and my brother continues to be in coma till date. Year after year, we liquidated all our properties to bring back my brother back to life. At times,there are things money cannot buy and cannot cure. Seeing my brother static in coma,my mother worsened her health as well. In the battle of emotional suffering, she succumbed to death due to cardiac arrest recently. 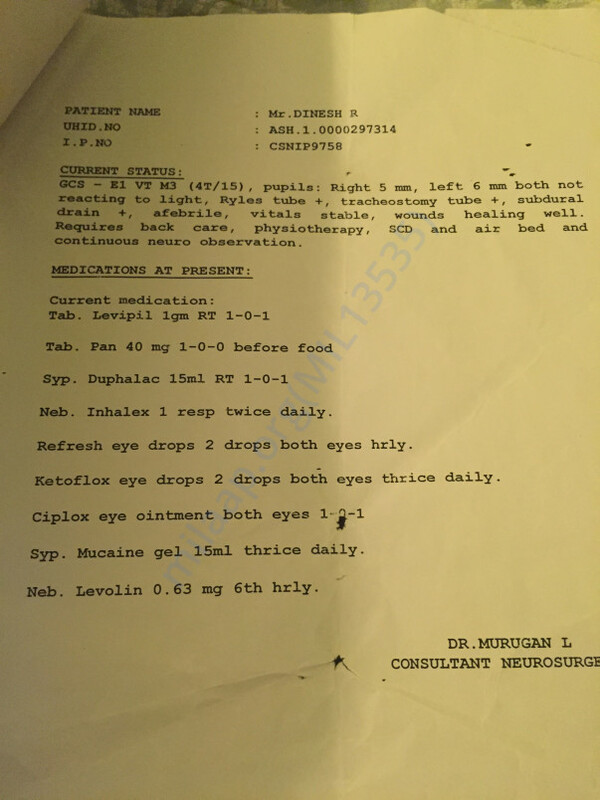 Ever since his admittance in the hospital ,about 80 Lac Rupees has been spent on his medication and other hospital bills. I am working at Nokia at Oragadam, and earn around 20k permonth, my father who is financially handicapped without a regular income and also having retired as a plumber are not able to support my brothers medical expenses which stands tall at INR 50k per month. We got too tired and couldn't fight anymore so we gave him the things which we were able to afford. My brother is now at homecare treatment, and we had stopped home nursing and physiotherapy.S ometimes what you are looking for comes when you are not looking at all, a sudden ray of hope, my brother started feeling sensory sensations ,doctors though said its a good sign, but also gave a bad news saying he would only have minimal functions even though he gets well. It's getting tough for us day by day, even for the minimal medicines and support. All our friends and family had helped us a lot in all possible way and now we are stranded with arms high seeking a helping hand. 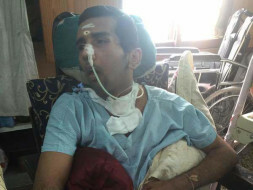 Dhinesh is off Ryles tube and he's gaining consciousness. There is some improvement in his health. He was discharged from the hospital and he is recovering at home. Doctors have suggested that it will take time for him to completely recover and it's a long road ahead of us. We're really thankful for the love and support which you have shown towards us, please keep praying for his recovery. 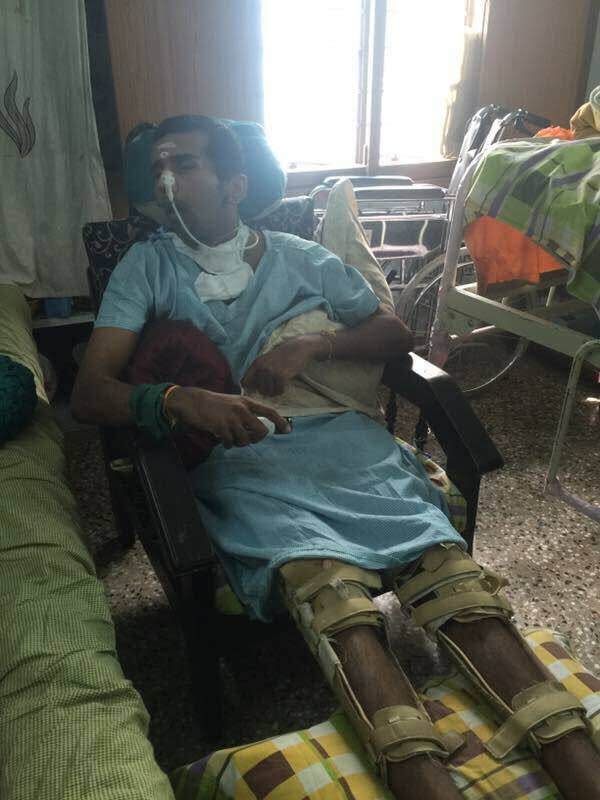 DINESH was admitted in hospital for a couple of days for observation as he was infected and got temperature and secretions . Now he is doing better and stable . Here is an update on Dinesh. Currently, Dinesh is at home. He is doing better. The G-tube has been removed, he can now eat properly without it. 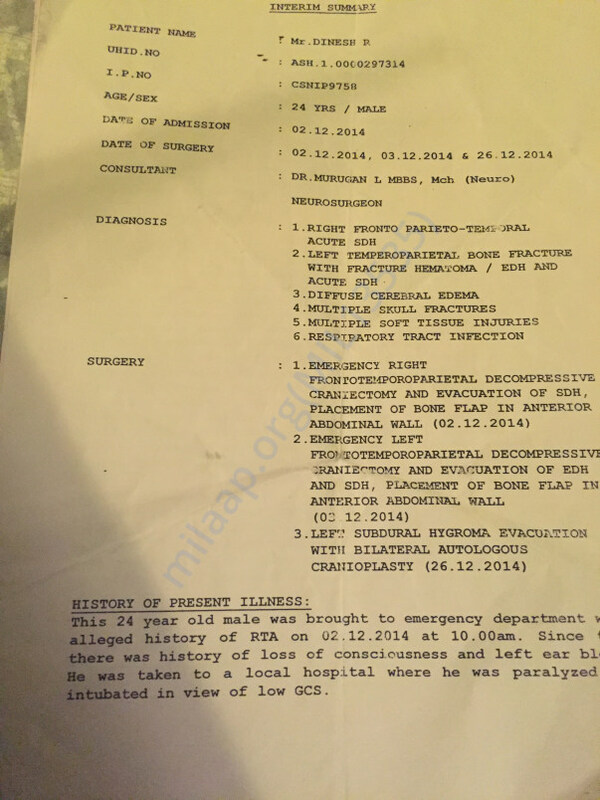 Doctors have advised to remove the tracheostomy tube as he is responding well to the treatment. There will be a minor throat surgery before the tube is removed.